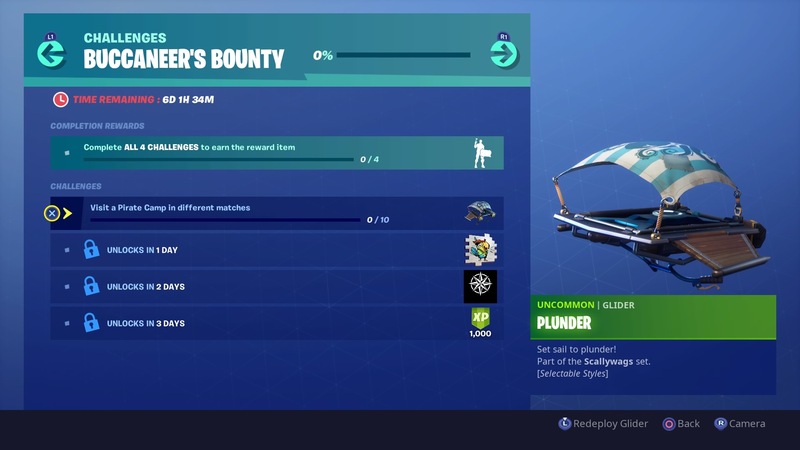 Along with your regular Fortnite fix, the Buccaneer’s Bounty event has a suite of new tasks for you to complete – all with fun in-game rewards. 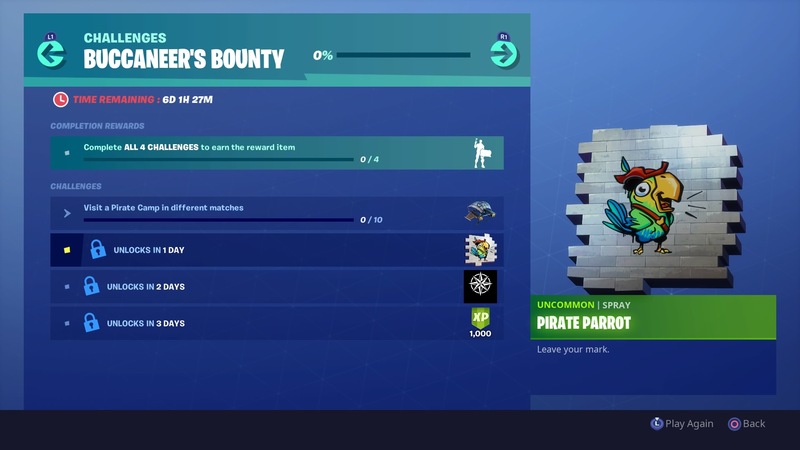 A massive part of Fortnite is flexing the newest stuff, so we thought we’d round up what you get for participating in the event, as well as what you need to do to lay your hands on that pirate booty. New challenges are unlocking each day, so check back for the latest! Kicking things off is the first challenge: “Visit a Pirate Camp in different matches”. This is pretty straightforward, and you can find our map of where to find all of the Pirate Camps in its own page. To complete this challenge though, you’ll need to visit one in 10 separate games. You can’t just visit 10 at once and call it quits. Although you don’t have to land at a Pirate Camp, so you can make your way there later in the game once things have died down if you wish. The most popular Pirate Camps will probably be the ones to the south of the Volcano, and in the west of Lazy Lagoon. If you’re after a less crowded time, try the ones to the northwest of Paradise Palms and southwest of Salty Springs. There’s some nice synergy here with one of this week’s main challenges: Visit different Pirate Camps in a single match. The second daily challenge is to search a Buried Treasure. 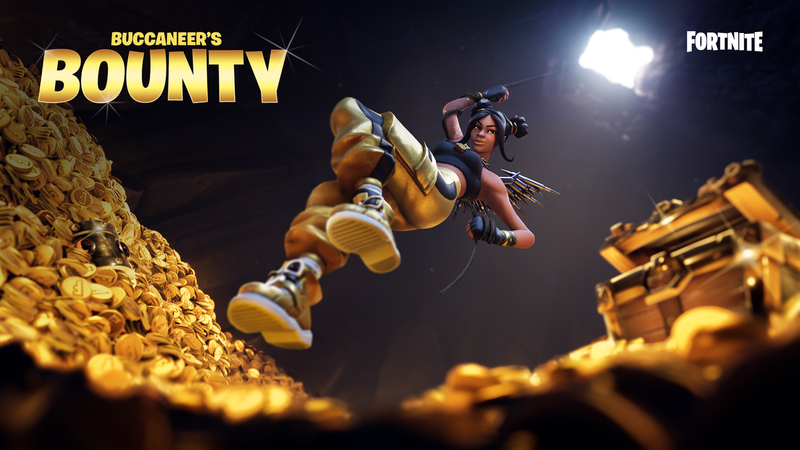 There’s an increased rate of Buried Treasure, as well as chests, in the new LTMs that are dropping every day. Keep an eye out for chests and you’ll soon find what you’re looking for. But the fun of the game isn’t the only thing you’re here for, but the sweet, sweet rewards as well. 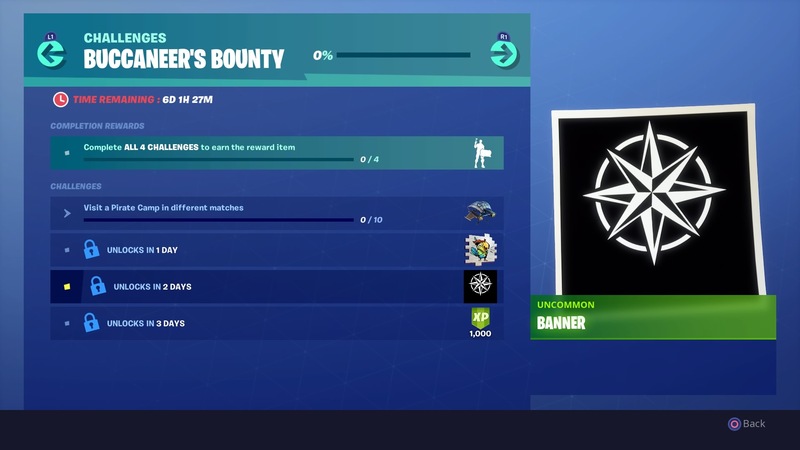 There are four new items that you can collect during the event – one each for the first three days of challenges, and then a fourth for completing them all. You also get 1000XP for your trouble. In-keeping with the piratey theme of the season, the Plunder glider features a jaunty blue-and-white striped pattern, wooden wings, and a mighty Kraken design on the top. Less exciting than the glider, but still quite cute. This colourful little guy stands out thanks to his neon palette, and we love how it contrasts with the graffiti-style shading. Yet more sea-faring fodder. The nautical star-like banner makes a bold addition to the line-up of banners. The headline reward for the event is a fun one. 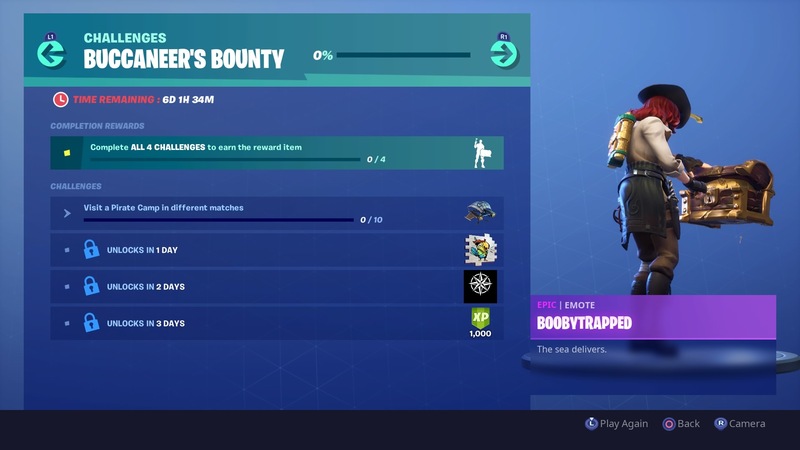 The Boobytrapped emote plays out a fun and well-animated scene. For more on what’s coming to Fortnite this week, check out the v8.30 patch notes.